After nearly 13 years as Chancellor of the Maricopa Community Colleges, Rufus Glasper, Ph.D. will retire to accept a position as President and CEO of the League for Innovation in the Community College (League). Dr. Glasper has served The Maricopa Community Colleges, one of the nation’s largest community college systems, for more than 29 years in a variety of roles from director of finance, CFO and Vice Chancellor. He was named Chancellor in 2003. The League, based in Chandler, Ariz., is an international nonprofit organization that provides strategic insights and undertakes policy work for the more than 800 institutions holding memberships in its League Alliance. The Maricopa Community Colleges is a member of the League. “As I have had the privilege to provide vision for initiatives impacting student success and innovation for our colleges, I am humbled and grateful for the opportunity to now provide leadership in the community college arena on a national scale,” Dr. Glasper added. Learn more in this official press release. 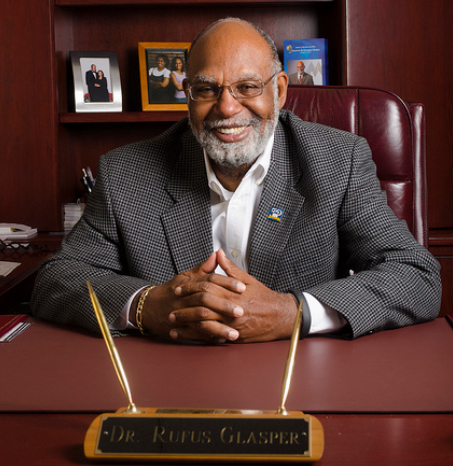 We join our community in thanking Chancellor Glasper for his years of service and leadership. We wish you well on your new educational journey.